Are your Google Ads giving you the return you need? Ever wonder if your Google Ads or other Pay-per-click (PPC) marketing efforts are paying off or coming close to reaching their potential? Are you concerned that you may be spending too much money or not reaching the right people? Have you tried PPC in the past, but you gave up because you felt it wasn’t working? If you answered yes to any of the above questions, a Pay-per-Click audit may be warranted. 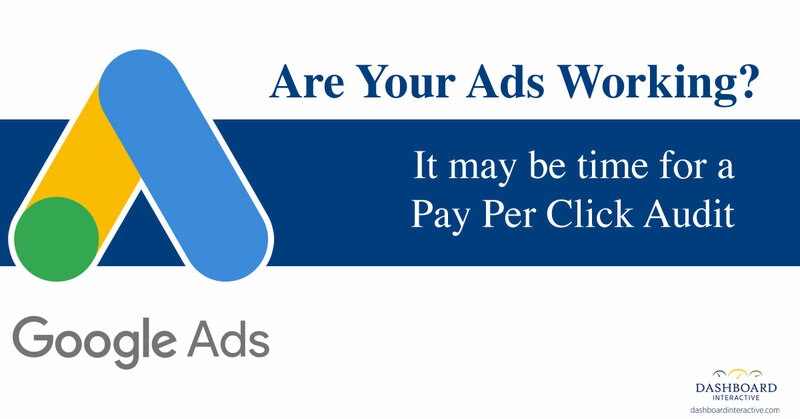 Why should you invest in a Pay-per-Click (PPC) audit? Most pay-per-click advertising campaigns have room for improvement. This is even more valid for small and medium-sized businesses because they have fewer resources and less expertise. We evaluate and optimize Pay-per-Click and other paid search campaigns on a daily basis and usually find opportunities that were either overlooked or the person managing the campaign was unaware of. This is due to a number of reasons, but it boils down to knowledge, expertise and execution. There’s usually a reason that a PPC campaign isn’t performing up to expectations. Today PPC is more complicated than ever due to continued Google enhancements and the numbers of options and variations available. Even the legacy term Google AdWords is no longer used because Google has rebranded. The appropriate term is now Google Ads, partially due to the options available. What do we evaluate in a PPC Audit? At Dashboard Interactive, we evaluate a number of components of your Google Ads or other PPC campaigns. Each is important and each can determine if your pay-per-click efforts are successful or not. Let’s take a look. Are the AdGroups set up properly? Are your Campaigns set up in a way that attempts to accomplish too much or should they be set up differently? Are you using the appropriate daily budget and how is it being allocated? The set-up of your campaigns and AdGroups can determine your effectiveness, efficiency and costs. How many characters are being used in your ads? How many ads are you running, how is your ad copy structured and is there a correlation between your ads and where your ads point? These questions can determine the number of potential customers who click on your ads and how many go elsewhere. Are the ads taking visitors to the right pages and are they designed in a way that connects with campaign visitors? What are your bounce rates and how do they compare? How about the conversion rate? A poor landing page or no landing page can potentially cost you money. What conversion metrics are you attempting to measure? Are your campaigns set up in a way that you can measure if your goals are being met, based on quantitative data? If not, you may be making decisions based on partial information or the wrong information. Are you using the correct types of keyword phrases and are they set up properly? There are lots of options available. What are the quality scores for the keywords that you are using and what about negative keyword phrases? All these and more can determine how much you spend and how often your ads are served. Are you testing each component of your campaigns and AdGroups? If not, it’s highly unlikely that you’re reaching your potential. It’s also highly likely that you’re wasting money. These are just a few of the items we evaluate in a PPC audit and there are many more. Other items include Extensions, Geographic Targeting, Bid Strategy, Competition and more. The above elements can comprise hundreds of combinations tested over time, which is why properly managing PPC is in no way as easy as some PPC vendors make it out to be. If you’d like to learn more about a PPC audit, contact Dashboard Interactive at 800-807-1852 or 763-242-2454. We’ve been specializing in pay-per-click advertising for over a decade and we are a Google Certified Partner. We’re good at what we do and we enjoy doing it. Maybe you need an additional set of eyes to take your pay-per-click and online marketing efforts to the next level. If we can’t find at least two elements of your Google Ads campaign that can be improved, we’ll refund the price of the audit. What do you have to lose?